Meet the Parents is the place where you can read about other family’s experiences of going on holiday with a baby or toddler, and get some ideas for your own holiday. Our latest contributor to the Meet the Parents feature is Keri Hedrick, who runs a website called BabyGlobetrotters.net. Keri is an Australian expat living in the UAE with 3 young children so certainly knows a thing or travelling with little ones! 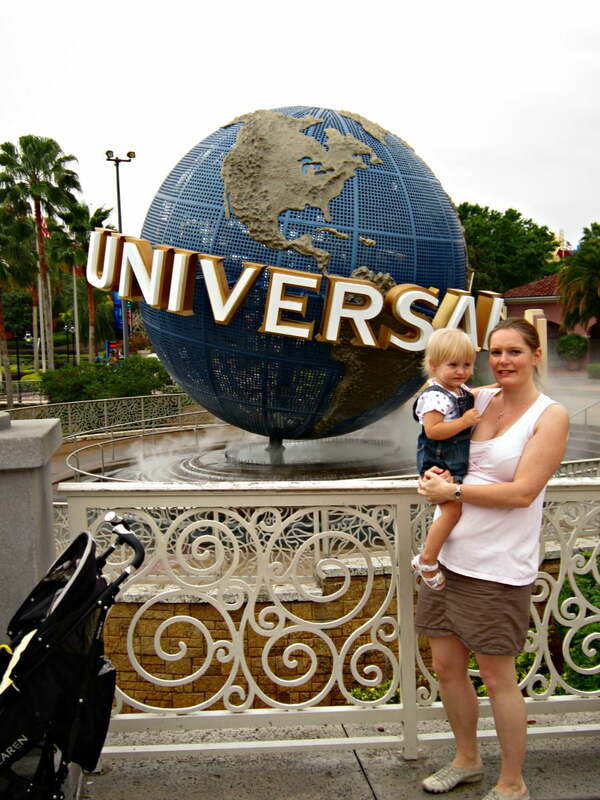 She tells us about her trip to Orlando with a toddler when she was 7 months pregnant with her 2nd baby, and has some top tips for anyone thinking of doing a similar trip. 1. Where did you go on holiday with toddler? We took our first little girl to Orlando, Florida in February 2012 for two weeks. 2. How old was your toddler when you went? At the time she had just turned 2 and I was about 7 months pregnant with our second. 3. Why did you choose to go there? When we lived in the UK we used to fly out to the US once a year, always exploring different parts and using the favourable exchange rate to our shopping advantage! This all came to an abrupt halt once I was pregnant with my first, so before the arrival of our second child we decided we needed one last US trip, as well as spend some time with our little girl before the new arrival (and yes I wanted to stock up on baby clothes!). Now that we had a toddler with us, Orlando and visiting Disney World seemed a logical city to choose. 4 . How did you get there? We flew from Gatwick with Virgin Atlantic direct to Orlando. We hired a car with an infant seat when we got there (Orlando is a huge city, having your own car to get around is really helpful). 5. Where did you stay? We stayed off site from the typical big Disney World hotels at a place called Lake Buena Vista Resort Village and Spa. It was a 2 bed self-catering apartment in a resort complex. 6. What did you like best about the Lake Buena Vista Resort Village and Spa? Its location. Although off-site from Disney World, you are only a 5-minute drive away – and given it can take 30 minutes to get from one side of Disney World to the other there was no problem with that. You miss out on some of the perks and discounts staying with Disney, but over the course of two weeks, we certainly didn’t want to be there every day. It was also right next door to one of the Discount Shopping Outlets – one of our primary reasons for travelling which was ultra-convenient! 7. What did your toddler like best about the place you stayed? The big pirate ship pool! Although she was too small for the pirate ship slide on her own, she loved splashing about in there with her dad – we didn’t get much outdoor pool time when we lived in London! I really saw her confidence around the pool grow during this trip – she is really fearless around water now. 8. What did you do during the day? Were there any great baby and toddler friendly days out in the local area? Orlando is one of the biggest family entertainment cities in the world! There were endless opportunities to get out and about. 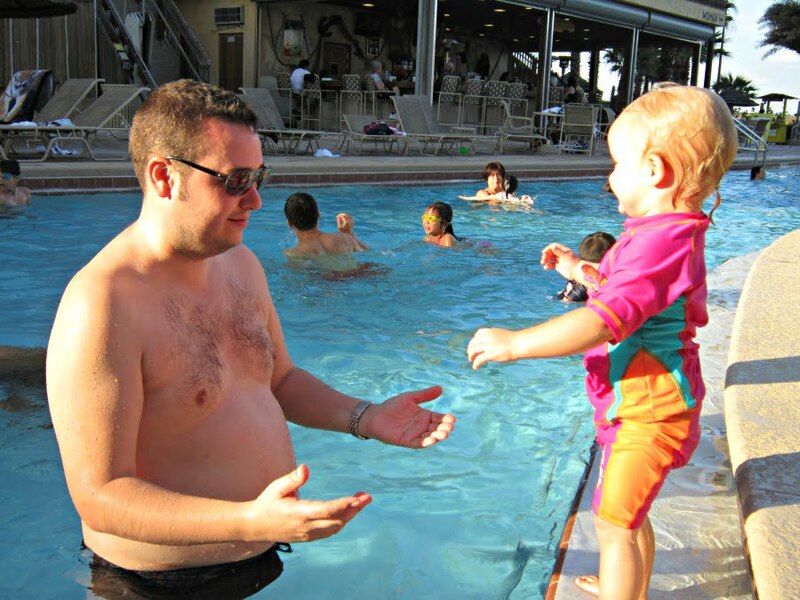 We normally picked one key activity for the morning (with the jet lag our days were starting at 5am anyway…) Then we’d rest by the pool or go shopping in the afternoon, followed by an evening at either Disney Boardwalk or Universal CityWalk if we weren’t self-catering. We never made it to any of the fireworks or evening parades, she’d always fallen asleep by then – or I had! As well as the big theme parks, there are lots of easy day trips too, you can head out to the Kennedy Space Center at Cape Canaveral, Daytona Beach, Boggy Creek Air Boat Rides. It’s funny, of all the days out and theme park rides, by far my daughters favourite was Gatorland! 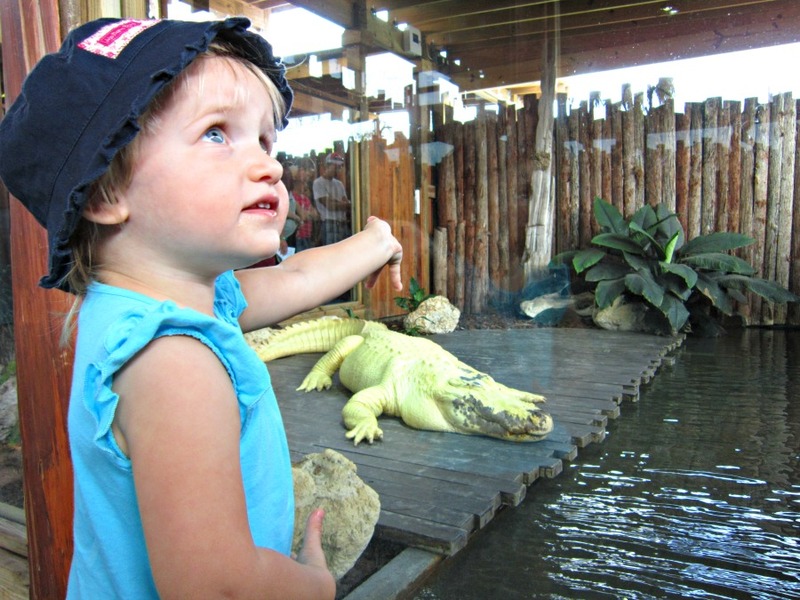 The alligators and snakes seemed to terrify her far less than the giant dressed up characters! (Something that parents should be aware of, as much as you might think your kids will love it, the larger than life characters can utterly terrify some kids). Yes we were well provided for within the hotel apartment – they obviously specialised in family groups. A baby cot and high chair were provided into the room. The curtains we had were sufficient black out quality. There was a washer and tumble drier in the room too as well as a full kitchen. 10. Why did you love it so much? This was the last holiday we took as a family while there were just the three of us. I had had a terrible second pregnancy up to this point, it was nice to be away from work and our daily commitments and spend time together with our little girl again, as well as each of us getting some time out to read by the pool, go shopping on our own and take things at a very easy pace. We have never had a holiday at quite as relaxed a pace since!! 11. Would you recommend it to other parents? Yes – with some provisos! Because we only had the one tot to worry about it was an enjoyable and relaxing experience. We were able to travel during an off-peak time (middle of the UK winter!) which was perfect weather for Orlando, and as the theme parks weren’t too busy, we could really take everything at our own pace – evenings out were even possible! We attempted an almost identical holiday three years later, staying at the same hotel in a 3 bed apartment – with 3 kids (5, 2 & 8 months), plus the grandparents, during school holidays. There was nothing relaxing about the Orlando leg of this trip! We felt the need to take the kids everywhere we’d been and had fun before but it was immensely crowded, we were late getting organized so couldn’t even get fast passes to a lot of the rides we thought the kids would enjoy. You had to be at the parks bang on opening time or expect to be queuing all day, very hot and very disappointed. The Disney magic certainly wears off in these conditions!! There were many enjoyable aspects for the kids, I mean what kid doesn’t enjoy a bit of Disney! But it is definitely the type of trip that needs very careful planning – right time, right ages, right place to stay (we stayed at the same place but many aspects badly need updating). Taking my in-laws was an absolute blessing though and something I would recommend for epic family trips on this scale! 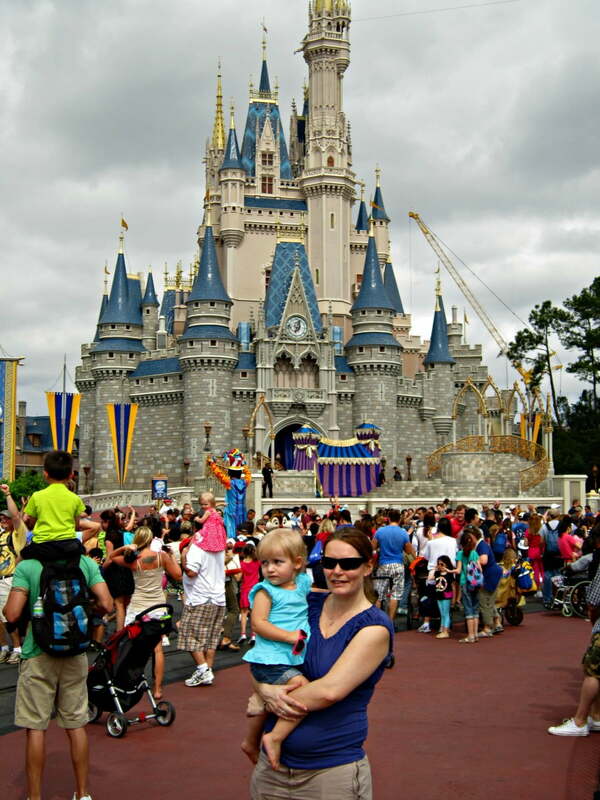 Sure babies and toddlers might not remember it per se but we still have some magical memories from our first ever Disney trip – and we will go back to Florida again (when all 3 kids are a fair bit older and over all the height restrictions!!) – there’s so much more to Florida than just the theme parks, we’ll spend more time at Fort Myers I think, and exploring the Florida Keys. Keri now lives in Abu Dhabi, UAE with her husband and three children. She writes about their travelling adventures around the globe at BabyGlobetrotters.Net as well as the challenges and pleasures of raising children overseas.